I took one pound of chicken breasts, put them in a gallon ziplock bag, and pounded them into cutlets. I then heated a skillet, wiped it with EVOO, and added the chicken. I sprinkled onion powder, garlic powder, and salt on the chicken and cooked it until done. 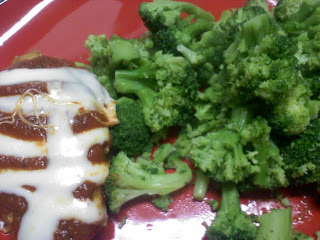 When it was done, I smothered each piece of chicken with pizza sauce from jar and topped them with light string cheese. I put a lid on top, turned the heat down to low, and let them simmer until the pizza sauce was heated and the cheese melted. Delish!! !